Sometimes we tend to get soo greedy too .. That day when I picked this humongous extra large veggie the price was the same as any other x small or small. And that week , we had Gobi Paratha , Pav Bhaji , still nearly more than half Cauliflower left. I had to make something of its own to finish them all.. and I made Cauliflower Curry. Just dry . No Masala No Onion No Garlic. Growing up in a family where 1 kilo of Onions can last for Two months.. Amma would personally not prefer to use Onions in a lot of curry, There was as such no restrictions , but somehow she never liked it much. Moreover its a No No , if its Tuesday or a Friday. And if there is a festival around the corner, Amma would not buy them at all. Now you could imagine how and why Onions could last soo long in Amma’s pantry. Garlic is one such condiment , that has never visited my maternal home till date. Did we follow Hare Krishna Hare Rama… ?? Oh No!!! Just that it could turn off my mum’s palette and she couldn’t stand the smell. But that does’nt mean we were deprived of any North Indian curries or amma compromised with flavors at home .. 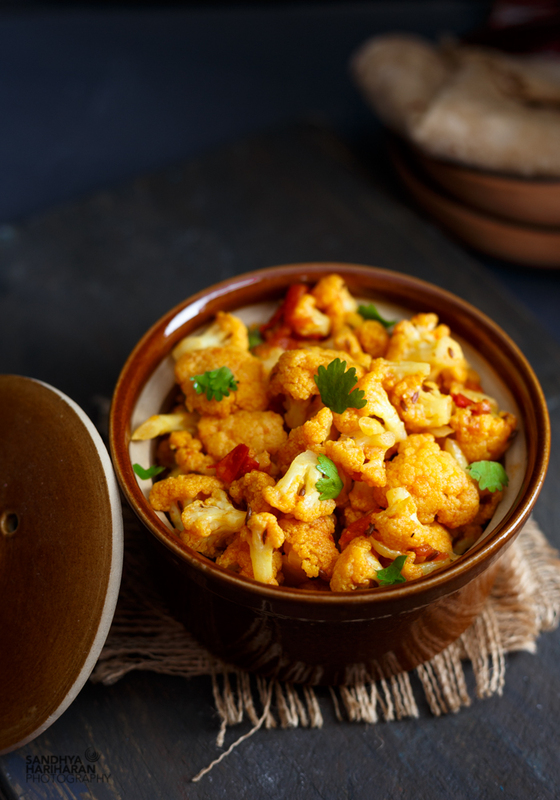 It tasted delightful and satisfying with some phulka’s, A very simple recipe with whatever is available at home – Turmeric Powder, Chilli Powder ,Salt and some Tomatoes. Sometimes I just fail to understand, why a lot of people use ginger – garlic and onions to every single curry to add some zing. Even without them, sabzi taste soulful with a lot of flavors coming just from the vegetable alone. A perfect on the go recipe , when you want to eat something light.When you want to enjoy it on a festival.Fits perfect for lunchbox series too. seeds. Once they begin to splutter, add the cauliflower florets and begin to sauté. Chilli Powder, Asafoetida and Salt and give it a good mix. the florets don’t get too soft and mushy. Garnish with coriander leaves and serve hot with Phulka’s. I love my cauliflower! This is not only healthy, also very tasty. This is a versatile vegetable . Love the color of the sabzi. I bet they would have tasted yum! and what is the name of that mat (roll) which is placed under the pot in first pic…?